On July 5, 1934, San Francisco port bosses pulled out all stops trying to break a two-month West Coast dock strike. The workers fought back. Police that day killed Nick Bordoise and Howard Sperry — two of seven workers killed between May 15 and July 20. The capitalist-class assault on the longshore strike angered rank-and-file workers from 100 unions in the Bay Area. They voted to strike in support of the port workers, overruling conservative union leaders. On July 16, the four-day San Francisco General Strike began as strikers and National Guard battled for control of the shut-down city. This is commonly described in labor history. 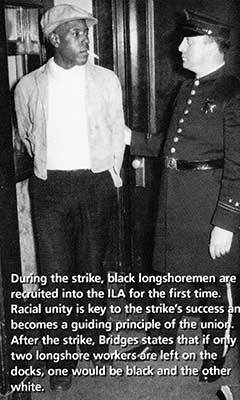 What is not so well known or emphasized is the conscious and concerted outreach to the African-American community by longshore strike leader Harry Bridges, which for the first time brought Black workers into the longshore union. “Before this time, I clung to views that the trade union movement was just formed to continue racial discrimination. But Bridges … felt that by keeping the unions lily-white, there would be a steady reservoir of black potential strikebreakers whenever strikes were called, which would weaken the unions when negotiations broke down. “The waterfront strike ended on July 31 when the International Longshoremen’s Association [now the ILWU] was recognized by the ship owners. Bridges kept his word: All piers were opened to blacks. They began to get the same work as everyone else, and some later became union officers. As part of the agreement, the [union] got its own hiring hall, which it controlled, and the men got a minimum 30-hour week and a raise to $1 an hour” (hartford-hwp.com/archives/45a/146.html). This year on April 4, the rank and file of Harry Bridges’ ILWU Local 10 honored the labor movement’s call for “no business as usual” in solidarity with Wisconsin public workers. The union’s motto, “An injury to one is an injury to all,” and Bridges’ working-class solidarity and unity pledge echoed through the 77 years. They did not report for work. No cargo moved at the international ports of Oakland and San Francisco for 24 hours, respecting the Rev. Dr. Martin Luther King Jr., who was assassinated on that date in 1968 while supporting African-American sanitation workers in Memphis, Tenn., who were striking for collective bargaining rights. 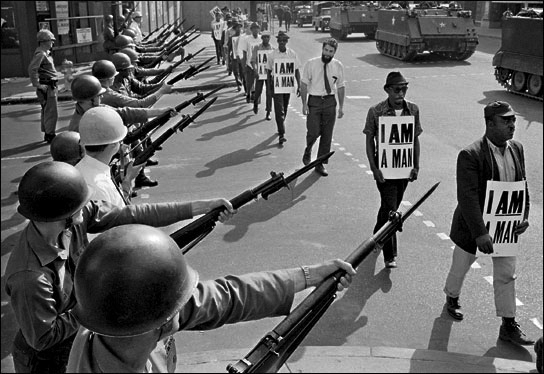 That strike’s symbol was the deeply expressive “I am a Man” picket signs. Dr. King was an honorary member of Local 10 and spoke to workers there only six months before he was assassinated in Memphis. © 2011 Workers World. This story was originally published July 9, 2011, by Workers World, 55 W. 17th St., New York NY 10011, ww@workers.org, www.workers.org, at http://www.workers.org/2011/us/1934_general_strike_0714/. Next articleRwanda’s Kagame, keynote speaker at a Sac State genocide conference?